Atenas Cordoba (La Liga) landed 27-year old American swingman J.J. Moore (198-98kg-91, college: Rutgers). He started the season at Las Animas in Chilean Liga Nacional. In 5 games he averaged 15.0ppg, 1.4rpg, 1.6apg and 1.4spg this season. Three years ago (two years after he left the college) Moore was drafted by Long Island Nets (D-League) in third round (58th overall). He attended Rutgers, The State University until 2014 and it is his fifth season in pro basketball. Moore's team made it to the Israeli Premier League Semifinals in 2017. He is a very experienced player. And here thanks to pro basketball Moore experienced life in four different countries playing on three different continents. He is familiar with European, Latin American and of course North American leagues. Moore has played previously professionally in Greece, Israel (Rishon), Dominican Republic (San Lazaro, Metros de Santiago, Leones de Santo Domingo and Don Bosco) and Argentina (Comunicaciones). C.Espanol P. made 26-of-32 free shots (81.3 percent) during the game. They also forced 19 Gimnasia LP turnovers. They shot the lights out from three sinking 14 long-distance shots on high 51.9 percentage. 24 personal fouls committed by Gimnasia LP helped opponents get some easy free throw opportunities. The best player for the winners was American Michael Henry (196-95, college: Buffalo St.) who scored 16 points and 9 rebounds. Francisco Gonzalez (190-94) chipped in 10 points, 5 rebounds and 5 assists. Point guard Leonardo La-Bella (184-86) produced 22 points and 4 assists and power forward Agustin Zuvich (201-95) added 10 points and 10 rebounds respectively for the guests. Five C.Espanol P. and four Gimnasia LP players scored in double figures. The winner was already known earlier in the game, so both coaches allowed to play the bench players saving starting five for next games. Atenas made 18-of-22 charity shots (81.8 percent) during the game. Atenas outrebounded Ciclista 35-21 including a 26-15 advantage in defensive rebounds. It was a great shooting night for Atenas especially from behind the arc, where they had solid 55.6 percentage. Ciclista was plagued by 24 personal fouls down the stretch. Nigerian-American power forward Lotanna Nwogbo (203-93, college: Longwood) orchestrated the victory with a double-double by scoring 14 points and 12 rebounds. 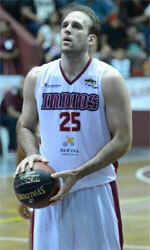 Forward Cesar Lavoratornuovo (190-91) contributed with 16 points and 7 rebounds for the winners. Four Atenas players scored in double figures. American forward Corbin Jackson (198-92, college: Florida Tech) replied with a double-double by scoring 21 points and 11 rebounds and Maximiliano Rios (182-81) added 20 points and 5 assists in the effort for Ciclista. Since the result was very predictable, it gave the chance for the coaches to test many bench players which allowed the starters a little rest for the next games. Rivadavia M. made 17-of-21 free shots (81.0 percent) during the game. Matias Bernardini (190-94) scored 16 points and 7 rebounds to lead the charge for the winners and center Abel Trejo (204-90) chipped in 12 points and 7 rebounds during the contest. Rivadavia M.'s coach Fernando Minelli used a ten-player rotation and allowed the starting five to rest. American power forward Demondre Harvey (201-93, college: ULM) responded with a double-double by scoring 18 points and 10 rebounds and swingman Elnes Bolling (193-91) scored 10 points, 9 rebounds and 4 assists. 28 personal fouls committed by Progreso helped opponents get some easy free throw opportunities. Uruguayan center Rogelio De-Leon (205-89) notched a double-double by scoring 20 points and 10 rebounds (on 6-of-7 shooting from the field) to lead the effort and guard Mauro Araujo (180-94) supported him with 20 points. Even 15 points by swingman Javier Ledesma (189-81) did not help to save the game for Progreso. Power forward Facundo Brizuela (203-80) added 15 points for the guests. Since the result was very predictable, it gave the chance for the coaches to test many bench players and allowed the starting five to get some rest. Salta Basket shot the lights out from three sinking 18 long-distance shots on high 52.9 percentage. They looked well-organized offensively handing out 21 assists. The best player for the winners was Lisandro Rasio (198-90, agency: Pro Sports) who had a double-double by scoring 18 points, 11 rebounds and 8 assists. Swingman Federico Mariani (190-92) chipped in 27 points, 5 rebounds and 5 assists. Four Salta Basket players scored in double figures. Swingman Bruno Oprandi (192-85) produced 23 points, 9 rebounds and 4 assists and point guard Nahuel Paciotti (183-97) added 24 points, 6 rebounds, 4 assists and 4 steals respectively for the guests. Union SF outrebounded Independiente 42-28 including a 13-2 advantage in offensive rebounds. The best player for the winners was point guard Emiliano Correa (188-91) who had a double-double by scoring 14 points, 10 rebounds and 4 assists. Gaston Marozzi (196-95) chipped in 19 points and 5 rebounds. Union SF's coach Juan Siemienczuck allowed to play the deep bench players in such tough game. The former international forward Axel Weigand (202-85) produced 24 points, 6 rebounds and 4 blocks and guard Alejo Crotti (182-92) added 20 points and 6 rebounds (was perfect 10-for-10 from the free throw line !!!) respectively for the guests. Five Union SF and four Independiente players scored in double figures. Obera TC dominated down low during the game scoring 52 of its points in the paint compared to Villa San Martin's 24. The best player for the winners was naturalized Paraguayan power forward Jose Fabio (200-77) who had a double-double by scoring 12 points and 14 rebounds. American power forward Chris Hooper (198-91, college: St.Francis, NY) chipped in 18 points, 5 rebounds and 4 assists (on 7-of-9 shooting from the field). American forward Sharwyn McGee (196-95, college: N.Alabama) produced a double-double by scoring 13 points and 11 rebounds and his fellow American import swingman Elijah Robinson (196-95, college: Emmanuel, GA) added 15 points and 5 rebounds (was perfect 8-for-8 from the free throw line) respectively for the hosts. Both teams had five players each who scored in double figures. Ameghino was plagued by 24 personal fouls down the stretch. The best player for the winners was American forward Joshua Simmons (201, college: Dillard) who had a double-double by scoring 18 points and 10 rebounds. Guard Lautaro Fraga (184-92) chipped in 21 points. Swingman Mateo Gaynor (199-90) produced 16 points, 8 rebounds and 4 assists and power forward Juan-Luis Abeiro (195-88) added 14 points and 9 rebounds respectively for the guests. Five Deportivo Norte and four Ameghino players scored in double figures.